Used in conjunction with HH-66 Adhesive in the preparation and cleaning of tarps, pool covers, furniture, sport domes, inflatables, signs & banners, matting, tension structures, sporting goods, protective linings, liners, awnings, trailer covers, footwear, flexible hose, industrial curtains, boat covers and vinyl repair kits. . Also use HH-66 thinner to clean brushes, rollers, sprayguns, and other types of applicators. 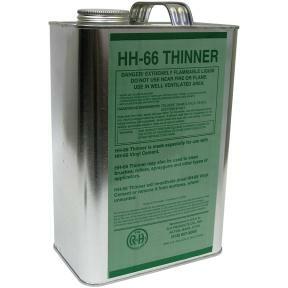 Cautions: HH-66 Thinner is made from the correct combination of acetone, MEK, and toluene. Flammable, do not use near fire or flame. Vapor may cause flash fire. Avoid prolonged breathing of vapor, contact with skin and eyes. Use with adequate ventilation. Volume: 128 oz. (1 Gallon). Note: This product can not be shipped by air.